1. Clean the inside of the flask with neutral detergent and hot water before using. 2. It can be sterilized with strong liquor. 3. Avoid contact with acid and salt in daily use. 4. It is prohibited to fill this product with anything other than alcoholic beverages. 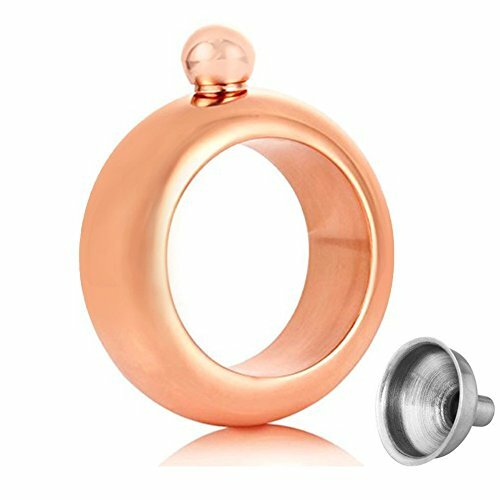 The bracelet flask in cuff bracelet made of 304 stainless steel with food grade.Featuring a delicate vacuum electroplating process, it glistens in sunlight, and does not fade. It sports the perfect inner diameter that is suitable for most people to wear and comes with a stainless steel funnel. It is not only a delicate bracelet, but also a gorgeous flask, you can put whiskey, liquor, juice or other drinks in it. Wearing it out today, to surprise your family and friends, this innovative bracelet flask might be the most useful and stylish accessory you own. The Bracelet Bangle Flask holds approx. 3.5 ounces of your favorite illicit beverage in its stainless steel ring. A spherical bauble at the top unscrews to grant access. The bracelet has an inner diameter of 2.5" and an outer diameter of 3.5", weight: 6.7 ounces. It has a cool design that will make you the coolest person in the pub, party, and music festival. Wear a pair to up your style, diversify your booze selection, and make that dry wedding reception or party not such a waste of a Saturday night after all. A PERFECT GIFT! An unexpected surprise for your family and friends! Trust me, they'll love it!The perfect combination of bracelet and flask, subtle and hidden. If you have any questions about this product by Ateman, contact us by completing and submitting the form below. If you are looking for a specif part number, please include it with your message.